At Britannica we’re taking a look at how this type of literature can stir a reader’s imagination and emotions, while connecting them to events, places, and people from the past and present. Poets carefully choose and arrange language for its meaning, sound, and rhythm. Some poems are simple and humorous, while others try to express truths about life, tell stories, or honor someone. Poetry comes in many forms and styles, which often makes it difficult to define exactly. 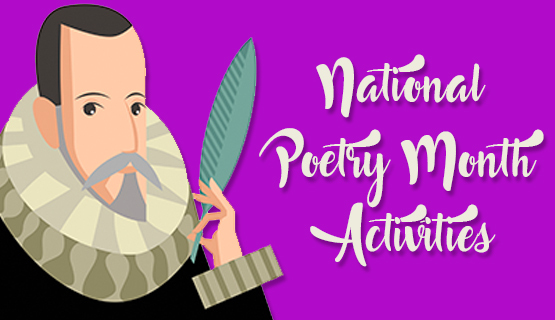 Explore poets, poetry styles, and how poetry has been used to share historic events with these upper-elementary and middle school activities and graphic organizers. Students will gain an understanding of slam poetry by observing, creating, and performing. Slam poetry is a form of performance poetry that combines the elements of performance, writing, competition, and audience participation. It is performed at events called poetry slams, or simply slams. The name “slam” comes from the way that the audience has the power to praise or, sometimes, destroy a poem and from the high-energy performance style of the poets. • To begin the activity, have students analyze the differences and similarities between traditional poetry and slam poetry. • Next, view this YouTube video as a class. Have students take notes on the performer’s main points, emotions, energy, and emphasis. • Have students begin by researching possible topics they are passionate about. During their research, direct students to collect information about the events and ideas related to their topic and note their reaction to each. Use the Events, Ideas, Reactions Graphic Organizer to help scaffold this activity. • Using their research and recorded reaction, have students write short slam poems. • Host a poetry slam! Britannica School contains articles about traditional poetry, slam poetry, and many research topics that will interest students. If you don’t already have access to Britannica School, you can sign up for a free trial and get full-product access! Activity 2: Fact or Fiction? Students will read the poem “Paul Revere’s Ride” and investigate inconsistencies between the poem and the actual events of his ride. • Day One: Discuss the background knowledge that students have regarding Paul Revere’s ride. Then have students investigate the events of Paul Revere’s ride. This can be done individually or as a group. Finally, use the Britannica Timeline Graphic Organizer to build the details of the evening. • Day Two: After students review their timelines, introduce the poem “Paul Revere’s Ride” by Henry Wadsworth Longfellow. Read through the poem with the students, pointing to inconsistencies between the poem and the actual events of Paul Revere’s ride. Have the students use the Venn Diagram Graphic Organizer to compare and contrast the poem and the actual events of Paul Revere’s ride. The Britannica LaunchPacks: Social Studies Paul Revere Pack for Grades 6-8 (also available for grades 3-5 and grades 9-12). It includes articles about Paul Revere, his famous ride, the Sons of Liberty, and the Battles of Lexington and Concord. It contains the primary source poem, “Paul Revere’s Ride” by Henry Wadsworth Longfellow, along with images and a video. If you don’t already have access to Britannica LaunchPacks, you can sign up for a free trial and get full-product access! Pose this question to students: Can you think of any other times in history when something like this has happened? Does it still happen today? I hope you enjoy these “poetic” activities for April! I’ve shared suggested resources for these activities from Britannica LaunchPacks: Social Studies and Britannica School. If you don’t already have access, you can get free access now, no strings attached. Give it a try, or use these strategies with your own classroom resources!